Learn oil painting fast without having to look for inspiration. A new set of oil painting materials is all well and good, but what does the artist paint? Looking for artistic inspiration can be a pain. Photos do not always translate to good oil paintings and looking for a great composition can be time consuming. Why can’t the artist just get on with exploring art techniques and color mixing without the fuss? A challenging project may not be looked for, merely simple exercises to get the brushes moving. Such projects may require a few hours to complete and entail basic art materials. This is where the first of three of my oil painting art instruction books comes in. Find 10 straightforward oil painting demonstrations on skies, landscapes, fruit, vegetables, animals, color-mixing and oils from old masters. Each demonstration lists the art materials required and a project overview describing an introduction to the project, project features and challenges. Step by step images and in depth instructions follow, guiding the artist from start to finish. Simple compositions permit ample focus upon color use and technique. And each project can be completed within two hours or so. The back of the book details art materials required, saving money and preparing for oil painting. A glossary is also included. 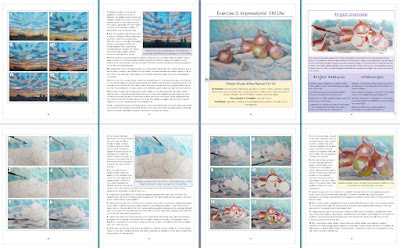 Learn oil painting fast without fuss with this book. Available on Kindle and paperback. With ample color images showing in-depth step by step instructions. Paperback measures 10x8inches and 82 pages in length.